A concerned participant in the process to build a deep Geologic Repository (DGR) at Bruce Power is amazed with Environment Minister Catherine McKenna’s response to a plan by Ontario Power Generation (OPG) to look at other sites for nuclear waste burial. 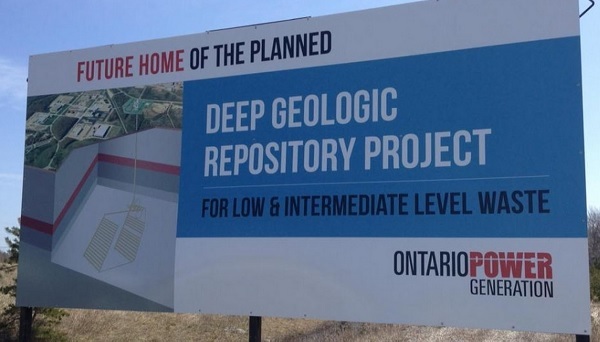 In February, McKenna ordered OPG to look at alternate sites before burying low and medium level nuclear waste underground in Kincardine near Lake Huron. In April, OPG responded to the Canadian Environmental Assessment Agency with a plan to look at other sites through computer simulations, instead of through actual site studies. Port Elgin Lawyer John Mann says this month, McKenna told Northwatch OPG will file it’s response to her request for additional information by the end of the year, and she will then plan the next step. Mann says it is astonishing and inexplicable that McKenna will not respond to OPG’s express requests in April for confirmation that their plan will meet the Ministers Order. Mann adds computer simulations clearly do not meet the order, when Kincardine studies took ten years. Mann submitted a freedom of information request a month ago, and says no documents have been provided related to the Order or a follow up. Mann questions why McKenna responded to Northwatch rather than post a public response on the DGR registry. He adds none of his concerns as a citizen and registered participant are being made public either. He says OPG is moving ahead with an undemocratic process to create the Kincardine DGR with a plan that has no approval from the federal government and on the backs of taxpayers. He adds OPG will not do extensive studies to find other possible host sites, but instead will conduct what he calls “sham” investigation. “We are looking at geologic regions, we’re not seeking additional or new host communities; we’re only considering it hypothetically from a geologic perspective,” says Jerry Keto, the vice president of nuclear decommissioning for Ontario Power Generation. In the meantime, other studies are being conducted in municipalities interested in hosting burial sites for high level nuclear waste like spent fuel. Mann says its time to dismiss the OPG DGR application, and move on with a process to build a single Repository for all of the nuclear waste, including high level spent fuel. Mann says the incomprehensible two-track two-DGR process will waste billions of dollars to separate nuclear waste currently stored all together at Bruce Power. “OPG has no intention of performing any legitimate and exhaustive studies Ordered by Minister McKenna,” says Mann. “Minister McKenna has no response to OPG’s contempt of her order. Minister McKenna has not responded even after two months. Thus, Minister McKenna must be content with OPG’s proposed meaningless path forward regarding inexplicable and meaningless hypothetical studies  that OPG has already predetermined are not as good as the only proposed site studied in Kincardine where coincidentally the nuclear waste has already been stored for over 50 years above ground. It must be a miracle. It defies common sense to think that Minister McKenna was concerned about hypothetical studies when she made her thoughtful order. For our government officials to treat citizens and taxpayers with such disdain and contempt is despicable. What would the framer’s of the Charter think of this conduct toward citizens and absolute waste of Taxpayer dollars? Is this the vision the Framer’s anticipated? “Bruce Power is planning to rebuild reactors, beginning sometime after 2020 but near enough that date and to produce electricity at the site for at least another 40 years. Meanwhile, the last waste produced by the reactors in 2060-65 will need to sit in pools for at least another 15 years and then in dry storage for another period of time. That takes us to a time frame between 2080 and 2090, 75 years from now. Nuclear fuels wastes, the most deadly of all, will sit on this site at least until then. That gives us all at least 75 years before any DGR at all is necessary, if, indeed, any DGR is necessary. OPG has stated during the hearings that used fuel wastes can be permanently stored with low- and intermediate-level wastes, meaning that there is at present, as well as for the foreseeable future, any need for a DGR for mops and rags. Even these mops and rags are not what they seem because they are regularly incinerated to become ash. So we are dealing with ash that stored in metal containers which, in turn, is stored in simple buildings. Meanwhile, the first low and intermediate-level wastes produced by OPG will now be more than 100 years old, a period of time when it will become available for free-release to the environment, according to Jerry Keto of OPG. How does our government justify spending $22.8 Billion Taxpayer Dollars to dig a hole for spent fuel nuclear waste? How does our government justify the difference of some $22 Billion Taxpayer Dollars to dig a hole for clothes and rags at an obscene cost of $1 Billion Taxpayer Dollars? Had Kincardine welcomed spent fuel in the Hosting Agreement signed by OPG and we were only dealing with 1 DGR, we would not even be dealing with this absolute nonsense! NWMO just released its Newsletter saying the DGR for spent fuel will cost an obscene $22.8 Billion Taxpayer Dollars, while OPG told the Joint Review Panel that the DGR for low and intermediate nuclear waste would cost an obscene $1 Billion Taxpayer Dollars! How is this astonishing difference in building a hole to store waste possible? Particularly when $1 Billion Taxpayer Dollars for clothes and rags was far too obscene to be justified in the first place! 1. NWMO has just released the cost estimate for the high level spent fuel DGR – an obscene and wasteful $22.8 Billion Taxpayer Dollars. The previous estimate was $16 Billion Taxpayer Dollars that NWMO presented as evidence at the recent Joint Review Panel Public Hearings in 2012 and 2013. 2. As a result there has been a stunning and obscene $6 Billion to $7 Billion Taxpayer Dollar cost INCREASE for the spent fuel DGR in a few short years. Why? How is this remotely possible? 3. Equally shocking, the evidence presented by OPG at the 2012-2013 Joint Review Panel Public Hearings was that the proposed OPG DGR for low and intermediate nuclear waste would cost an obscene and wasteful $1 Billion Taxpayer Dollars. 4. The unreasonable $21 to $22 Billion Taxpayer Dollar difference in price between the 2 DGRs makes the OPG low and intermediate nuclear waste DGR analogous to a nuclear waste “Dollar Store” storage unit with drywall construction, while the NWMO [created by OPG and 95% owned by OPG, with interchangeable employees] is building a spent fuel nuclear waste storage unit analogous to “Tiffany’s” and paved in Gold with Diamond studded walls. 5. This irresponsible waste of Taxpayer Dollars cannot be justified. The shocking difference in Taxpayer waste between the 2 DGRs is impossible to comprehend even by government standards. 6. After all the DGR is nothing more than a gravesite for nuclear waste. It is nothing more than a hole in the ground with no beneficial function whatsoever. 7. Embattled SNC-Lavalin is on the NWMO letterhead related to past DGR Taxpayer cost estimates. How many Taxpayer Dollars has embattled SNC-Lavalin been given in this 2-Track 2-DGR process boondoggle, and how many Taxpayer Dollars is embattled SNC-Lavalin predicted to take from Citizens and Taxpayers in the future from this 2-Track 2-DGR process boondoggle? 8. Citizens and Taxpayers would rather have these huge Taxpayer Dollars directed to our Health, Education, and Legal Aid Budgets rather than the deep pockets of embattled SNC-Lavalin. 9. And to build this Taj Mahol grave for spent fuel, NWMO predicts operations could begin as “early” as between 2040 and 2045, having begun the process in 2000! Something is incomprehensibly wrong with a project that takes over 40 years to complete even factoring in the fact that government is running the DGR process. It is taking our government over 40 years to dig a grave, when it took less than 10 years to land a man on the moon. Can anyone explain this to anyone? 10. Can anyone explain how it was possible for OPG and/or NWMO to spend $100 Million Taxpayer Dollars related solely to talking with Canadians to obtain their views on storing nuclear waste!? Highway robbery! This was reported in the Toronto Star on March 13, 2013. The unlimited funds available for the DGRs is impossible to justify and must be the subject of a convened Public and Judicial Inquiry. 11. And can anyone explain why there is “urgency” in burying the clothes and rags with 2040 as the earliest date for spent fuel to find a home, with 30 years of spent fuel cooling on the surface prior to being placed in any DGR after 2040 at the earliest? 12. In the meantime, the Dollar Store OPG DGR for clothes and rags will be approved and built by government, with highly dangerous radioactive intermediate nuclear waste [similar to radioactive spent fuel] placed in a bargain basement, cutting cost, cheap OPG DGR modeled after the failed WIPP DGR in New Mexico. 13. The obscene Taxpayer Dollar waste and cost can never be justified. In light of the $6 to $7 Billion Taxpayer Dollar cost increase since 2012, one can only imagine what the ultimate cost will be up to 2045 – and beyond to monitor it [security to environment and people and terrorism and natural elements, etc]., to fix it, to expand it, to deal with a WIPP-type catastrophe, etc. etc. etc. Ultimately the DGR process will cost Trillions and beyond of wasteful Taxpayer Dollars. 14. Instead of spending the obscene amount of Taxpayer Dollars in a positive and creative way by researching, developing, and creating energy from this nuclear waste, we are burying the radioactive problem out of sight! Who on the planet outside of OPG, NWMO, CNSC, JRP, and SNC-Lavalin thinks that burying our nuclear waste problems is a good idea? – at obscene Taxpayer Dollar waste! 15. The answer is simple: We must terminate the 2-Track 2-DGR boondoggle, and all meaningfully work toward an overall plan for ALL nuclear waste for the benefit of all Citizens and Taxpayers. A Public and Judicial Inquiry must be convened. 16. Minister McKenna has a solemn obligation and duty to respond to these serious questions and concerns from the Citizens and Taxpayers that she has the honour and privilege to work for. Unfortunately Minister McKenna remains silent. As does Premier Wynne, as does Prime Minister Trudeau, as does Jeffrey Lyash, as does Michael Binder, as does Ken Nash. Shameful!